This local patient to Vancouver who is in his mid to late 30’s came to us wanting to make a significant cosmetic impact with as many grafts as possible. He understood the need for density up front and coverage over as much area as possible. The goal was to start with rebuilding the hairline and frontal zone working back as far as possible. If achievable, light coverage in the crown was the goal. Going into this surgery he knew the possibility would exist for a smaller 2nd procedure to address the crown to a greater extent if desired. 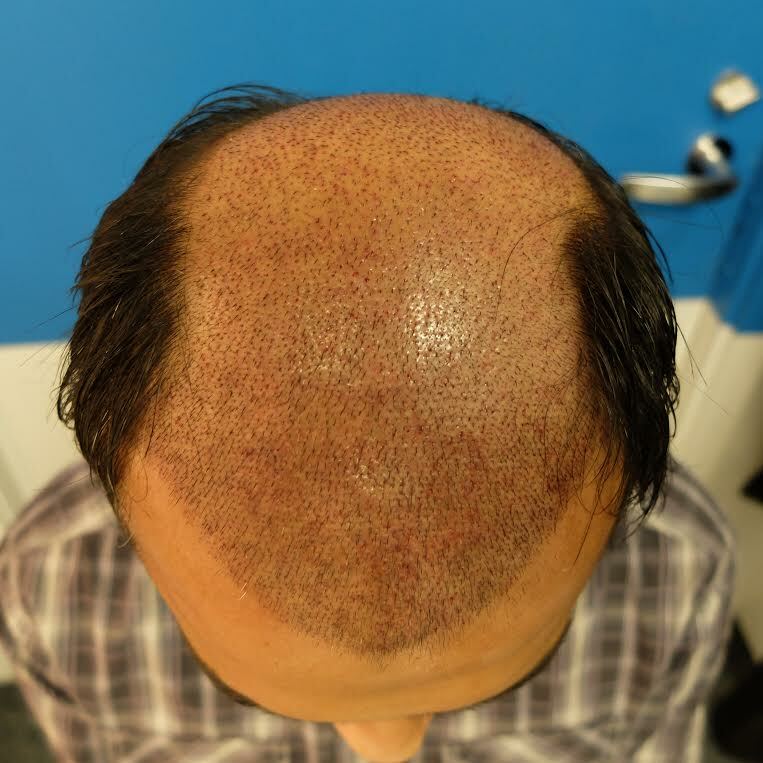 This one session using 5300 follicular units Dr Hasson was able to achieve the cosmetic impact the patient was looking for and at the same time allowed for some light crown coverage to take away the bald look. These photos represent 8 months post op from his surgery. Needless to say the patient is very happy. The patient now has the option to add further density into the crown with a second procedure of around 2-2500 grafts if he wishes to. The patient is using Proscar. 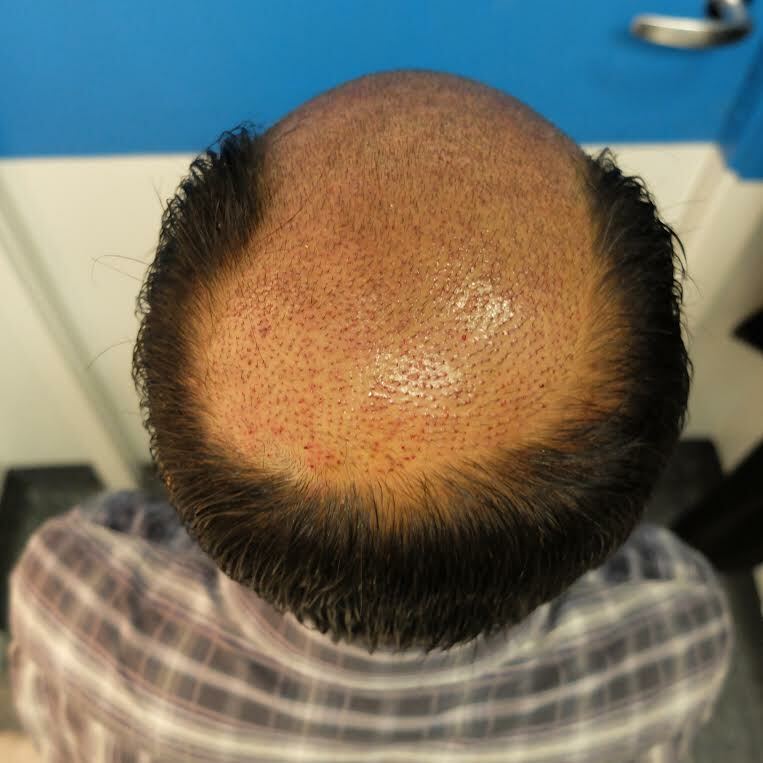 Here are the immediate post op photos to see that the patient had full coverage over the entire balding area. Very good work although he must be itching to fix his crown now. Thanks for the comment. He certainly has the donor to fix the crown but everyone is different some patients are happy with the change that fixing the front and mid scalp brings and spend a while getting used to their new hair before jumping back in and having crown work. It can be a good idea to take some time to get used to the new look and work out how much a thinning crown bothers them. For most people it is taking that first step to do something that they find hard and we all go through it asking questions like is it going to work? Will it look natural? After a very positive outcome the first time around making a decision for a second pass is a whole lot easier.